Nagula Chavithi, a festival to worship Nag Devatas Serpent Gods, is mainly a women festival. Nagula Chavithi is observed by married women for their wellbeing of their children. During the Chavithi festival, women keep fast and observe Naga Puja. Devotees offer milk and dry fruits to Sarpa Devata at the Valmeekam or Putta snake pits. On Nag Chaturthi day, Ashtanag seven hooded cobra is worshipped. Nagula Chavithi in Kartika masam is a major festival in Andhra Pradesh and some parts of Karnataka. The rituals and puja procedures are different from place to place. 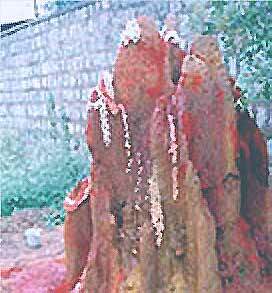 Some people place Naga devatha idol at home and perform puja. But in some places, devotees go to ‘Putta Snake pit and offer naivedyam and perform other pujas there. Nagpanchami or Naga Panchami, also known as Nagara Panchami, is observed on Panchami during Shravan month July – August. Naga Panchami 2010 date is August 14. Nag Chaturthi upvaas 2010 date is August 13. 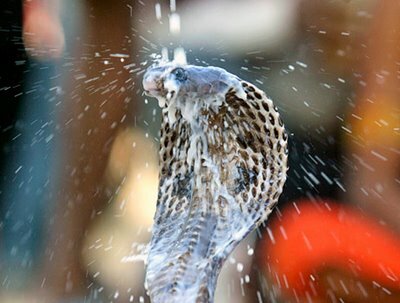 In Gujarat, Nag Panchami 2010 date is August 30. On Nagpanchami day, Naga Devatas Serpent Gods are worshipped and offered naivedya such as fruits and milk. On Shravana Shukla Paksha Panchami, Nagara Panchami day, many auspicious rituals are performed throughout India. The rituals and pujas may differ from place to place. In some areas of South India, Naga Panchami is observed as Garuda Panchami. Garuda, also known as Garuthmantha, is worshipped on the day. Naga Panchami puja is known as Nagula Panchami in Andhra Pradesh. Mauna Panchami vrata is one of the main rituals performed on Nagpanchami at Baba Bhaidyanath Temple at Deoghar. It is widely observed during Shravani Mela. In West Bengal, Orissa and Assam, on Nagapanchami Manasa Devi Ashtanag puja is observed. Manasa Devi is the Goddess of snakes. A similar festival known as ‘Guga Naumi is observed in Punjab, Haryana and Himachal Pradesh. Naga Panchami, nine prominent Serpent Gods Nagas or snake Gods are fed with milk and worshipped by certain rituals and pujas. Ananta, Vasuki, Padmanabha, Sesha, Kambala, Shankhapala, Dhruthrashtra, Takshaka and Kaliya are the nine prominent Serpent Gods.